Energy Miser compact-fluorescent light bulbs help users save up to 75 percent in energy costs. They are made in both household and commercial designs, such as spiral, plug-in, globe, and reflector bulb shapes, in a wide range of color temperatures. 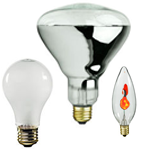 Select EnergyMiser bulbs are also outdoor-rated while others are ENERGY STAR qualified.